The recent news from Bing announcing that .pharmacy domain names are now seen as a sign of eligibility to advertise on the popular search platform is a significant show of confidence in the new Top-Level Domain program. I sat down with Carmen A. Catizone, MS, RPh, DPh Executive Director of the National Association of Boards of Pharmacy (NABP) for online pharmacies and prescription-only medications to chat about the benefits this exciting new partnership and what it means for members and consumers. Sue Schuster: For the benefit of our readers, can you give us some background on what NABP is and why you decided to apply for .pharmacy Carmen? Carmen Catizone: The National Association of Boards of Pharmacy (NABP) was established in 1904 and is an impartial organization that assists its members, the pharmacy regulatory boards, to protect the public's health. We manage the pharmacist license transfer program and administer the pharmacist competency examinations required for licensure on behalf of the state boards of pharmacy. NABP's accreditation programs also cover the areas of Internet pharmacy, pharmacy wholesale distributers and pharmacies that dispense durable medical equipment and supplies. 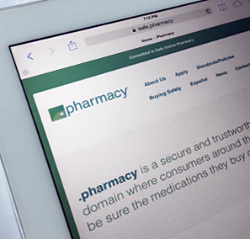 We applied for the .pharmacy Top-Level Domain (TLD) to create a safe online environment where consumers could be confident that the websites where they buy medication or obtain information are safe and legitimate. NABP also sought to keep the TLD out of the hands of a third party that may turn a blind eye to illegal activities. We recognized .pharmacy as a way to turn the tide against sophisticated criminals who build authentic looking sites and can easily duplicate verification logos to trick unsuspecting consumers into thinking they are visiting a legitimate online pharmacy. With .pharmacy, the "seal of quality" is built into the URL. Sue Schuster: So how would an organization go about getting a .pharmacy domain name? Carmen Catizone: Before registering a .pharmacy domain name through a Registrar, eligible organizations must first complete and submit an online application and pay an application fee to NABP. We then review the application and existing or proposed website content for compliance with all program standards. If the organization's application is approved, the applicant receives an electronic alphanumeric token, which they must provide to one of NABP's contracted Registrars in order to register the requested URL. Compliance with program standards is monitored on an ongoing basis and approved sites must reapply annually in order to renew their registration. Sue Schuster: What are the benefits of a .pharmacy namespace for registrants and patients? Carmen Catizone: A .pharmacy domain guarantees consumers that they are purchasing their medication through a legitimate online pharmacy. Consumers will be able to tell just by looking at the URL if the site is safe — there is no need to do additional research or look for logos, nor can the .pharmacy URL be faked by a rogue website. Sue Schuster: Recently it was announced that Bing has revised its online pharmacy advertising policy to recognize .pharmacy TLD as a sign of authenticity. Could you please explain how this will work, and what this decision means for .pharmacy, and for Internet users? Carmen Catizone: Since 2010, Bing, along with Yahoo! and Google, has recognized NABP's accreditation and approval programs as the sole qualifier for advertising prescription drug terms. Bing Ads requires that all pharmaceutical advertisers in the United States or Canada, are accredited by the NABP. .pharmacy is the evolution of these programs, and Bing has formally recognized this domain name as an indicator of legitimacy. This partnership will see NABP and the global coalition that supports the .pharmacy domain program take huge strides in combatting illegal online drug sellers and keeping the public safe. Sue Schuster: So what impact does this partnership have on the domain name industry in general? Carmen Catizone: Bing's announcement underscores the value of not only .pharmacy but also other verified TLDs in the Internet community. An organization with verified domain names, like .pharmacy, .bank or .med, ensures that Registry operation programs standards are met prior to use of the domain name. This pre-verification demonstrates to the public that the products and services offered on a site using a verified TLD meet defined standards set by the Registry operator. In addition, search engines can rely on .pharmacy and other verified TLDs as a means to properly vet businesses before allowing them to advertise services in highly-regulated industries like pharmacy, medicine, or finance. From advertising to search, verified TLDs can be leveraged by search engines to ensure relevant and lawful businesses are displayed at the top of consumers' search results. This type of unique verification service is a great example of how new TLDs are changing the landscape of the Internet for the better and this partnership with Bing is a great endorsement of these benefits. Sue Schuster: Could you talk us through the process of working on this important partnership, and importantly what Bing sees will be the benefits that it receives from supporting .pharmacy? Carmen Catizone: .pharmacy is easy. You see .pharmacy in the domain name and you know that NABP has done the legwork to ensure that the website associated with this domain is legitimate, lawful, and meets Bing's advertising standards. It demonstrates the priority Bing places on consumer safety, and, potentially opens up new pharmacy advertising markets for Bing. Bing and other search engines can simply look to the right of the dot and know that this advertiser checks out in a given country without additional action on their part. Sue Schuster: So what's next for .pharmacy? What is your focus for the future of the TLD? Carmen Catizone: As .pharmacy enters its second year of general availability, the program has three primary focus areas. First, increase adoption of the .pharmacy TLD throughout the pharmacy community; second, encourage registrants to fully and actively utilize their .pharmacy domain names to demonstrate their commitment to safe online pharmacy; and third — and perhaps most importantly — help consumers to understand the dangers of buying medicine from unknown and unapproved sources over the Internet and to recognize that online pharmacies and pharmacy information sites with the .pharmacy domain name are legitimate and safe. In the perfect scenario, .pharmacy becomes the standard for online pharmacy. That means, if your online presence is related to pharmacy, you have a .pharmacy domain name. If you are looking for pharmacy services or information, you look for a .pharmacy domain name. Consumers, health care professionals, and search engines alike will recognize .pharmacy as the place for safe online pharmacy. The rationale for .pharmacy is a strong one particularly in lieu of the global increase in online purchasing and door-to-door delivery. Our new economy is one in which many consumers want the convenience of avoiding trips to a brick-and-mortar store. However, online fraud is rampant. So this level of vetting and security could go a long way in reassuring consumers that something as important as medication is at minimal risk of fraud. Similar security measures with .BANK is also a very good idea. We at Public Citizen, a consumer advocacy organization based in Washington, filed comments with ICANN, expressing our view that ICANN should reject the National Association of Boards of Pharmacy’s application for the generic top level domain “.pharmacy,” for reasons of public interest. NABP's control of the .pharmacy domain confers legitimacy on pharmacies sanctioned by NABP, to the detriment of those that are not. In its application to ICANN, NABP proposed an unfair standard that would bar online pharmacies that serve U.S. consumers but are located outside of the United States from using the domain (see NABP’s application at Section 18(a) IV*). This would exclude many licensed pharmacies which offer American consumers low-cost medicines of quality. Whether a pharmacy is located in the United States does not determine whether a pharmacy is licensed and provides medicines of quality. Consumer access to medicines depends in significant part on price and competition. It is inappropriate to allow NABP to control such an important gTLD while it maintains exclusionary plans for the domain, which work against the consumer interest in a robust market of quality affordable pharmaceuticals. Public Citizen is a consumer advocacy group founded in 1971 and based in Washington, DC. We have more than 400,000 members and supporters. Our areas of organizational focus include, among others, pharmaceutical safety and efficacy as well as access to medicines. * “NABP is currently evaluating a validation process whereby only online pharmacies and related entities that meet all regulatory standards in the jurisdictions in which they are based AND IN WHICH THEY DO BUSINESS, INCLUDING PHARMACY LICENSURE, drug authenticity, and valid prescription requirements, as applicable, would be permitted to register in .PHARMACY.” [Emphasis added.] Virtually no US states license non-US pharmacies. Like the respected consumer advocacy group, Public Citizen, we filed a public comment with ICANN, the nonprofit that oversees global domain names and ensures the stability of the World Wide Web, opposing the National Association of Boards of Pharmacy (NABP) application for the generic top level domain “.pharmacy.” Lee Graczyk, our lead organizer, also delivered 24,349 petition signatures opposing NABP’s bid to control the .pharmacy domain to an ICANN Public Forum in Los Angeles. When this article came out, we felt the need to reiterate our concerns. Despite good intentions of protecting consumer safety, we believe the domain will ultimately be anticompetitive and detrimental to consumers seeking affordable medicine online. The NABP has an institutional history demonstrating its objective to prevent drug importation. The NABP’s Internet Drug Identification Outlet Program, launched in 2008 with the help of a Pfizer grant, publishes a “not recommended” list of “rogue” online pharmacies that unfairly groups legitimate international online pharmacies with criminal enterprises that sell fake medicine or real medicine without a prescription. With this list, the NABP created a false dichotomy when it comes to prescription drug safety. The organization would have us believe that all U.S. prescription drugs are safe while all foreign drugs are not. The .pharmacy program headed by NABP appears to be subject to the same biases. Certainly there are unscrupulous rogue sites that use deceptive and underhanded tactics to get American consumers to buy fake or adulterated medication. But there are also safe and legitimate Canadian and other international pharmacy sites, which require a doctor’s prescription and allow consumers to access needed medications at much lower prices. Due diligence is critical when choosing an online pharmacy to ensure safety. RxRights will support any NABP efforts to warn and educate consumers about actual rogue sites, those known to sell falsified and substandard medication or real medication without a prescription. But their intentional grouping of dangerous sites with safe online pharmacies is unreasonable. Misinformation of this nature threatens public health and limits American access to affordable medicine. In addition, the .pharmacy initiative is funded by five big pharmaceutical firms: Eli Lilly, Gilead Sciences, Janssen Therapeutics, Merck and Pfizer. These multinational pharmaceutical companies are clearly vying for control of the Internet so it can be used for a commercial advantage. Americans—and the global community for that matter—deserve Internet governance that maximizes information and protects the consumer’s right to safely access affordable medicine. Four million Americans import their needed medications from Canada and other countries each year (despite the fact that it’s not technically legal). Many have come to depend on this cheaper alternative—often saving 50 percent or more on U.S. prices. RxRights is an American-based consumer advocacy group that’s dedicated to ensuring access to safe, affordable prescription drugs and is 80,000 members strong. We feature tips on our website for finding a safe international online pharmacy. Mr. Catizone’s hope for .pharmacy is admirable. Indeed, we concur that there is a huge need for measures that differentiate the good actors from the bad in the online pharmacy world. We acknowledge his comment, “We recognized .pharmacy as a way to turn the tide against sophisticated criminals who build authentic looking sites and can easily duplicate verification logos to trick unsuspecting consumers into thinking they are visiting a legitimate online pharmacy.” However, a new top level domain operator that focuses on self-serving registration policies stands far from achieving that goal. Proponents of .pharmacy would like everyone to believe that their model is the only way to keep patients safe, yet experience shows it could have quite the opposite result under the current .pharmacy registrant policies. As an example, in the United States, patients who need medication and order them from a U.S.-based online pharmacy are likely to pay approximately the same price as they would pay at their neighborhood pharmacy. The main reason people turn to the internet for their medications is because they can’t afford the high cost of meds in their home country so they look to safe, licensed pharmacies in other countries to meet their medical needs. I particularly know this because almost every person who calls my office, as General Manager of the Canadian International Pharmacy Association (CIPA), starts by telling me a story about how much their local pharmacist just told them their medicine would cost. Apart from the NABP’s stated efforts to weed out bad actors that abuse consumers, it is equally important to acknowledge that there are many legitimate licensed online pharmacy websites, selling authentic medications according to doctors’ prescriptions, and under government regulatory oversight where they are located. However, under NABP’s current registrant policy requirements these licensed operators do not qualify for .pharmacy. CIPA members have operated with .com websites for the past 15 years and have served millions of people who cannot afford their medications in the countries they live. Unfortunately for those patients, if .pharmacy with its current eligibility criteria were to become successful in the way Mr. Catizone imagines, hundreds of thousands of patients will be faced with not filling prescriptions, cutting pills or skipping doses of medications; as reported by Kaiser Family Foundation. Rather than trying to put the genie back in the bottle and relying on dated protocols, what is needed is a constructive approach to online pharmacy safety that recognizes how people need and use the internet, embracing practices that became global almost two decades ago. People all around the world are purchasing products and services over the internet from wherever they can find a price they are prepared to pay for a legitimate product. Pharmacy is no different. In the internet age of the 21st century, what is required are ‘digital’ solutions that supersede ‘analog’ approaches of the last century. What Mr. Catizone and NABP really need to do is speak with – and listen to – the millions of Americans who cannot afford expensive medications to understand that a broader model, which recognizes and reflects what consumers are doing is what is required. Registrant policies that welcome safe online pharmacies such as CIPA is what is needed to achieve Mr. Catizone’s safe pharmacy vision. Excluding those of us who are legitimate, ready, willing and able to register .pharmacy domains does not serve internet consumers, while allowing the rogue pharmacies to continue to wreak havoc on people’s lives. Innovation and consumer choice are at the heart of the internet, and applying a broader approach to .pharmacy would lead to a safer model that takes us all into a safer future. Local Time: Friday, April 19, 2019 02:21 PM PDT – Page Load: 0.3356 Sec.